The feet provide a means of locomotion, as well as function as a shock absorber for the body. - The arch of the foot is capable of absorbing the repetitive jolt of walking and protecting larger joints in the legs, hip as well as the back from wearing out and injury. How will custom foot orthotics benefit you? Improve chronic and acute foot and lower leg sports injuries. Optimise shoe fit and comfort and absorb shock. Aid child’s foot grow in more neutral or anatomically aligned position. Eliminate low back pain from leg length inequalities. Firstly, when you book with Greg, he will carry out a biomechanical assessment and gait analysis to determine whether orthotics would be of benefit to you. Greg will likely also implement foot and ankle muscular stretches and strengthening exercises in order to strengthen your foot, not just support the foot structures with an orthotic device. Greg makes use of CAD/CAM technology through force-plate gait analysis equipment for designing and manufacturing foot orthoses. The precision FreeStep and EasyCad system provides the ability to provide patients with foot orthoses within days. The force-plate measures both dynamic and static pressures acting on the bottom of the foot as well as the parameters of gait such as step length, step time, step velocity etc. and/or by taking a Dynamic Scan of your foot, based on your presenting complaint, the sport you play or what your needs are. 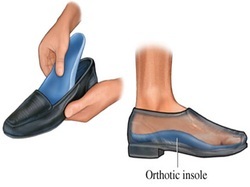 Rigid orthotic devices are intended to control function and are worn mainly for walking or dress shoes. They are often composed of a firm material, such as plastic or carbon fibre. Rigid orthotics are made from a mold after a podiatrist takes a plaster cast or other kind of image of the foot. Rigid orthotics control motion in the two major foot joints that lie directly below the ankle joint and may improve or get rid of strains, aches, and pains in the legs, thighs, and lower back. 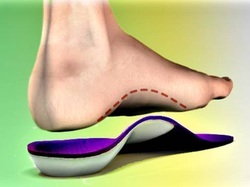 Semi-rigid orthotics provide foot balance for walking or participating in sports. The typical semi-rigid orthotic is made up of layers of soft material, reinforced with more rigid materials. These orthotics are also used to help athletes ease pain while training and competing. Soft orthotics are generally used to absorb shock, increase balance, and take pressure off uncomfortable or sore spots. They are usually effective for diabetic, arthritic, and deformed feet. Soft orthotics are characteristically made up of soft, cushioned materials so that they can be worn against the sole of the foot. Like rigid orthotics, soft orthotics are also made from a mold after a podiatrist takes a plaster cast or other kind of image of the foot. An orthotic must fit snugly into a shoe and not move around. 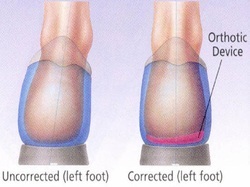 Open heeled shoes do not accommodate orthotics well which can cause the orthotic to slide out the back of the shoe. Dress shoes for women and some styles for men are snug fitting slip-ons, leaving little room for addition of an orthotic. Orthotic design can be varied to fit the narrower slip on style shoe. of shoe wear for different shoe types and activities. Even when used properly, the materials of an orthotic can wear out. As long as the plastic plate has not deformed, the device can be reprocessed by replacing worn out materials and heel post stabilizers.